Want to find new 4th of July desserts to make this year? You’ve come to the right place to get the scoop on Red, White and Blue Ice Cream. 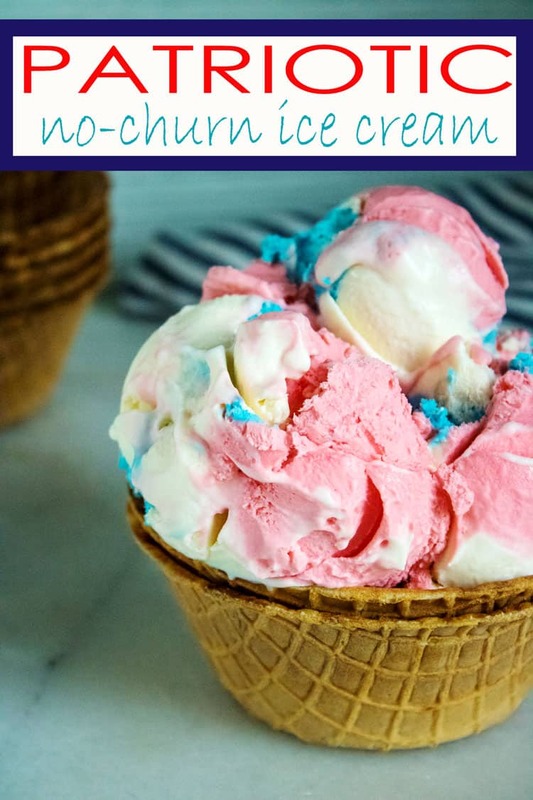 Our Red, White and Blue Ice Cream is an easy homemade ice cream recipe you can whip up in just a few minutes. Then, set it aside to freeze for 5-6 hours or overnight before serving. Once you learn how to make homemade ice cream, you’ll be sold on the easy process and taste. Not to mention, it is so easy to develop your own homemade ice cream flavors. You might even want to experiment with new flavors. There is no shortage of 4th of July dessert recipes, and we’ve got several here as well. For starters, you might like our Patriotic Poke Cupcakes, our 4th of July Mini Cake Trifles, and 4th of July Poke Cake. They are all festive summer dessert recipes that are ideal to serve at your next patriotic red, white and blue party. Homemade ice cream has been around since around the second century B.C.. It’s no wonder that there are many variations on how to make it. Now, people even make ice cream in a bag and call it a science project. That’s what I call school! What are your favorite homemade ice cream flavors? Remember the old 38 flavor ice cream shops? Making ice cream at home can mean developing many fun and unique flavors to suit your personal taste. 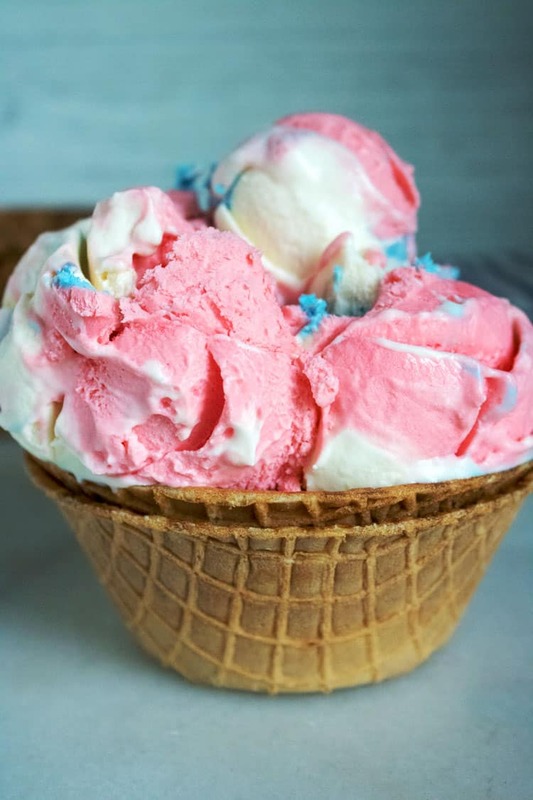 Our Red, White and Blue Ice Cream 4th of July dessert is a traditional vanilla flavor. You could also mix things up by using a different flavor. Try a flavored extract or a drop or two of a food safe essential oil like peppermint, bubblegum or cotton candy. You can also use natural ingredients to flavor your ice cream. We’ve mixed up so many flavors of no-churn ice cream. Take a look at 18 of our favorite no-churn ice cream flavors. From Mint Chip, to Lemon Blueberry, to Black Cherry and White Chocolate no-churn ice cream, there is a flavor to satisfy everyone craving one of these tasty summer dessert recipes. 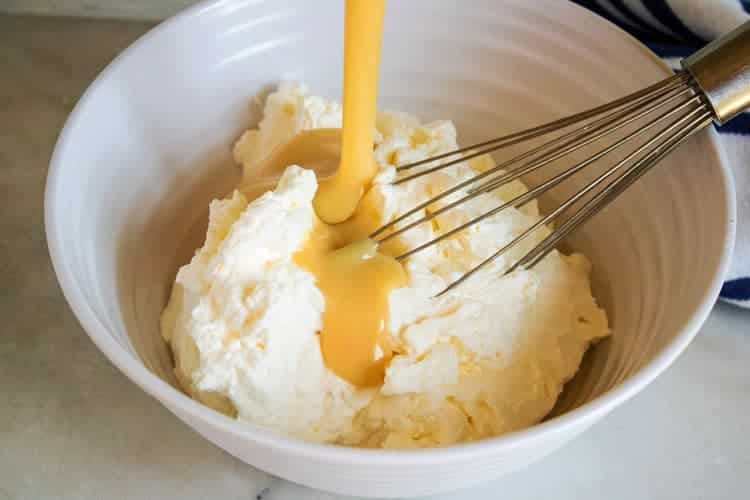 Beat the heavy cream using a hand-held or stand mixer. A stand mixer can be a lot easier because you can whip the heavy cream at a higher speed with a quality stand mixer. We really love our Kitchenaid Pro-line stand mixer. Fold in condensed milk and flavoring. 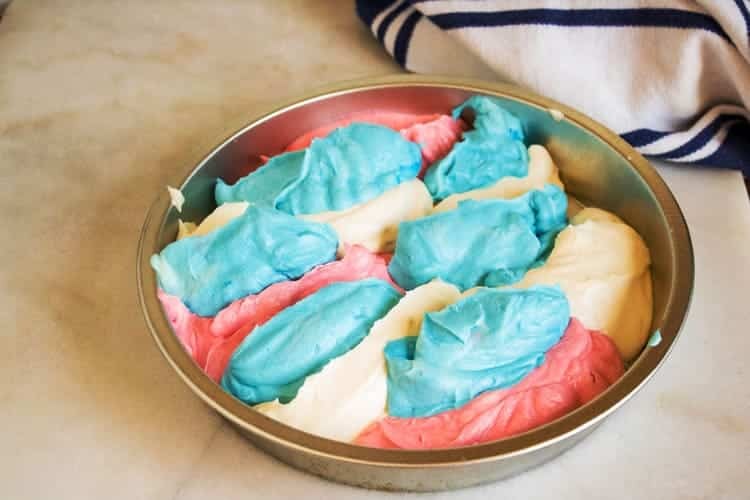 Divide ice cream into three bowls and add food coloring to two of the bowls and fold in blue and red food coloring into two of the bowls. 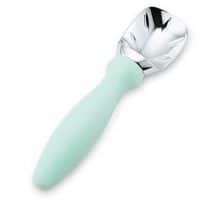 Scoop by spoonfuls (alternating colors) into a freezer safe pan or container. Then, continue scooping until all the ice cream is added to the pan. Lift pan and tap gently on counter-top to release air-bubbles. Next, cover and freeze for 5-6 hours. Once you learn how to make no-churn ice cream at home, you might never want to buy ice cream from the store again. There is just something about a tasty homemade dessert that makes it special. 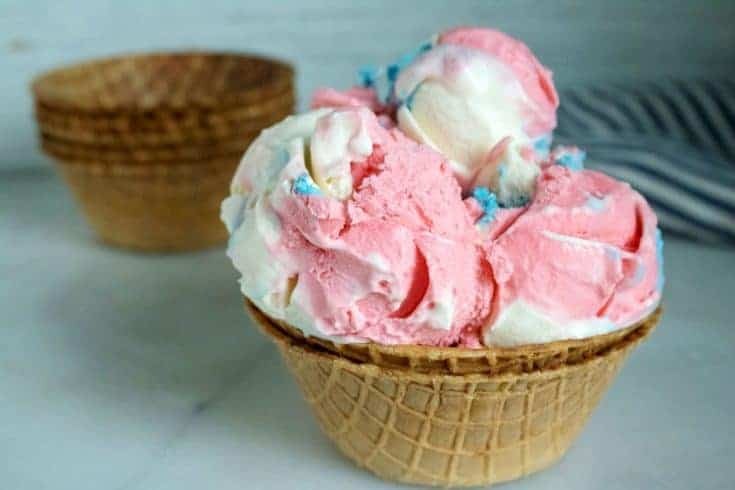 The added bonus is you can mix in whatever flavors your heart (or taste buds) desire, or make it into a festive 4th of July dessert like our Red, White and Blue Ice Cream. 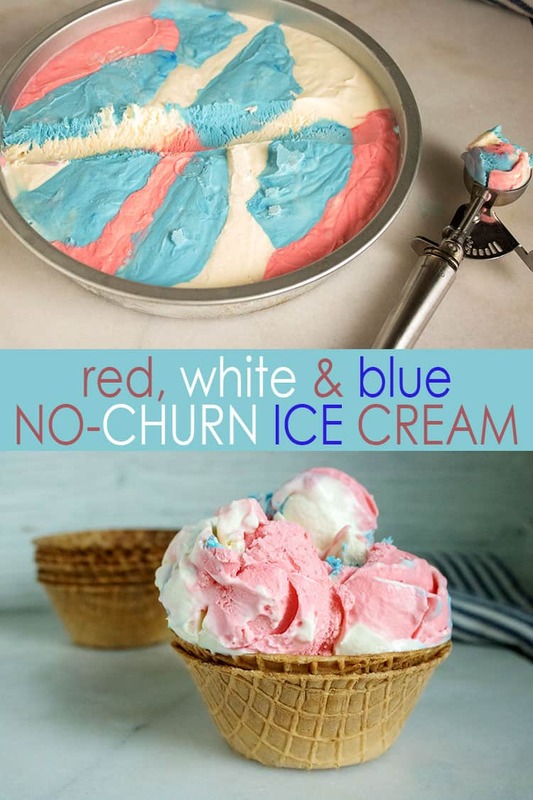 This colorful easy no churn ice cream in a refreshing summer dessert that is the perfect fit when you want to make a festive Fourth of July dessert, Memorial Day dessert, or even a Labor Day dessert that is red, white and blue. 1. 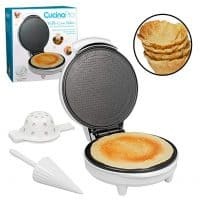 With a mixer, beat heavy whipping cream until thick. Pour in sweetened condensed milk and vanilla and fold in until smooth. 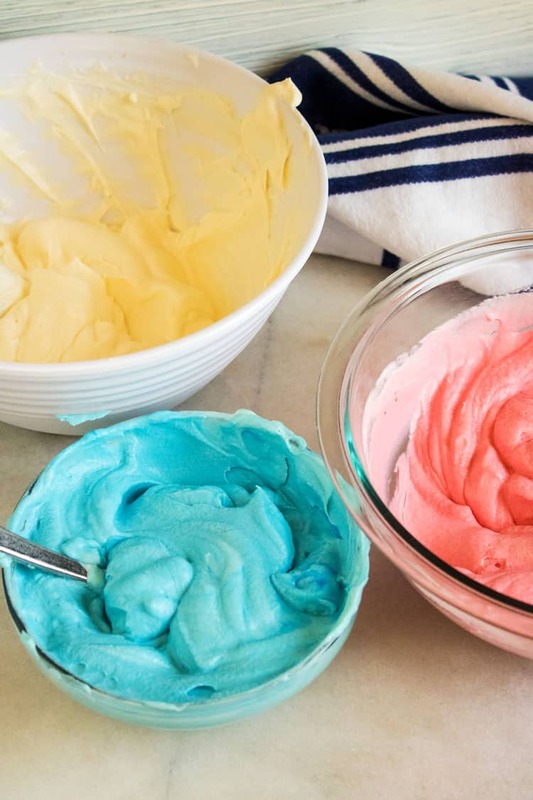 Divide ice cream into 3 bowls, adding blue gel food coloring to one and red food coloring to a second bowl. Leave one bowl white. 2. Next, spoon ice cream into a freezer safe container, alternating colors to create an multicolored ice cream. 3. Freeze for 5-6 hours or overnight. When it is time to serve, remove from freezer and let sit on the counter to soften for 5-10 minutes before serving. 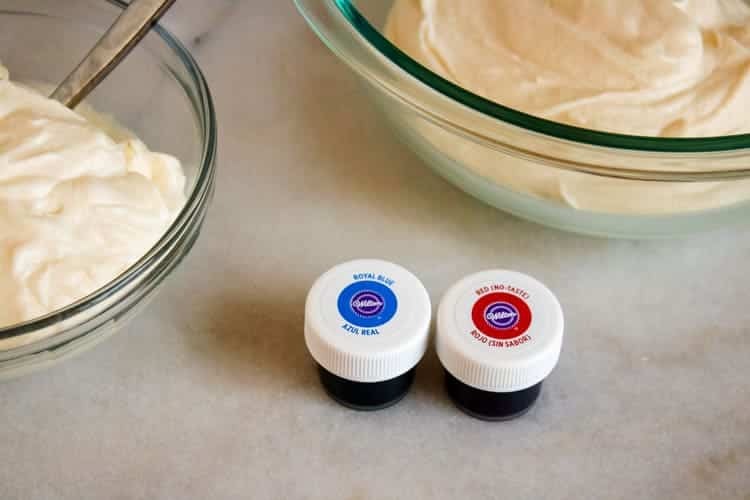 Add extra food coloring to make a more vibrant shades of red and blue. 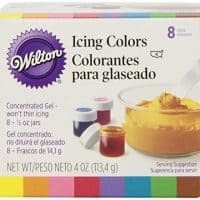 Gel food coloring works great.